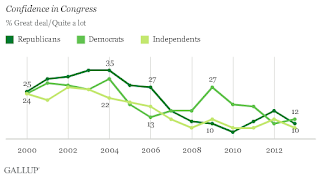 Gallup's new poll has been released in an article there by Elizabeth Mendes and Joy Wilke , "Americans' Confidence in Congress Falls to Lowest on Record," subtitiled, "Congress ranks last on list of 16 institutions; military earns top spot again," showing that "Americans' confidence in Congress is not only at its lowest point on record, but also is the worst Gallup has ever found for any institution it has measured since 1973." "WASHINGTON, D.C. -- Americans' confidence in Congress as an institution is down to 10%, ranking the legislative body last on a list of 16 societal institutions for the fourth straight year. 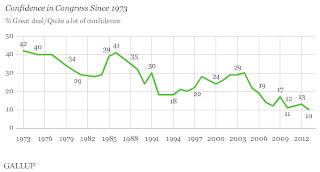 This is the lowest level of confidence Gallup has found, not only for Congress, but for any institution on record. Americans remain most confident in the military, at 76%. "Small business and the police also continue to rank highly, with 65% and 57% of Americans, respectively, expressing 'a great deal' or 'quite a lot' of confidence in these institutions. 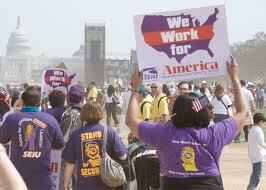 Joining Congress at the bottom of the list are Health Maintenance Organizations (HMOs) and organized labor. Congress' low position is further underscored when one looks at the percentage of Americans who have little or no confidence in each institution. The slight majority of Americans, 52%, have this level of confidence in Congress, compared with 31% for HMOs. 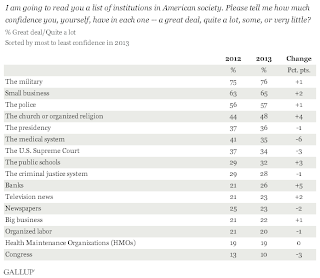 "Americans' confidence in several institutions measured in the June 1-4 Gallup poll has shifted since last year. Americans have become more confident in banks, organized religion, and public schools, and less confident in the U.S. medical system, the Supreme Court, and Congress. 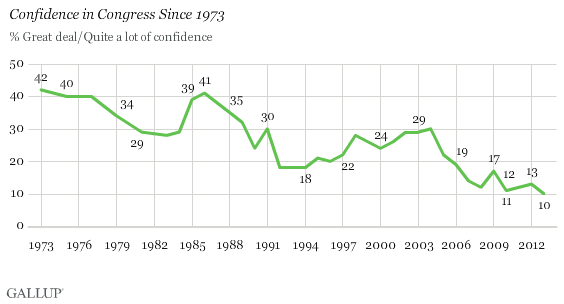 "The percentage of Americans expressing a great deal or quite a lot of confidence in Congress is the lowest for a trend that dates back to 1973. The high point for Congress, 42%, came in that year. "Confidence in Congress has been at its lowest points for several years, while it was higher in the mid-1980s and in the early 2000s. "Democrats, independents, and Republicans are about equally likely to express low confidence in Congress. This is a change from the past and likely reflects the split control of Congress. "Historically, members of each major party expressed greater confidence in Congress when their party held control of both houses. During most years of the Republican-controlled House and Senate in the early to mid-2000s, Republicans were at least slightly more likely than Democrats to express confidence in Congress. 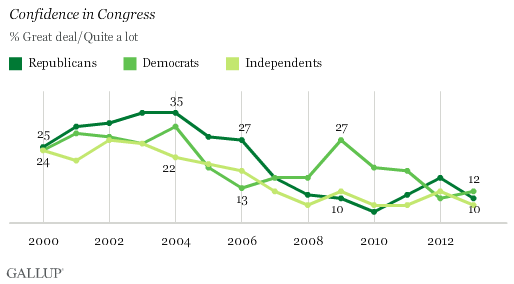 After the Democratic Party took over both houses in 2007, however, Democrats began reporting more confidence than Republicans in the institution. "Between 2009 and 2012, a period that saw Congress come under split control, these partisan differences gradually diminished, and this year, Democrats are a mere two percentage points more likely than Republicans to report having a great deal or quite a lot of confidence in Congress. "Americans' confidence in Congress is not only at its lowest point on record, but also is the worst Gallup has ever found for any institution it has measured since 1973. This low level of confidence is in line with Americans'low job approval of Congress, which has also been stuck below 30% for years. 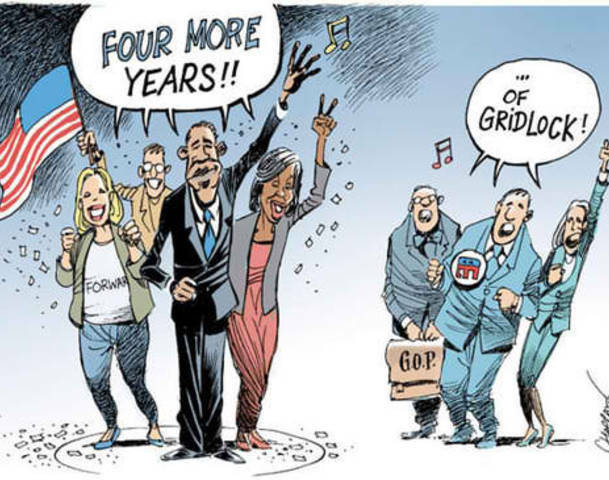 "The divided Congress, with Democrats controlling the Senate and Republicans the House, is likely part of the reason for the low levels of confidence rank-and-file Democrats and Republicans express, and is tied to Americans' frustrations with Congress' inability to get much done. 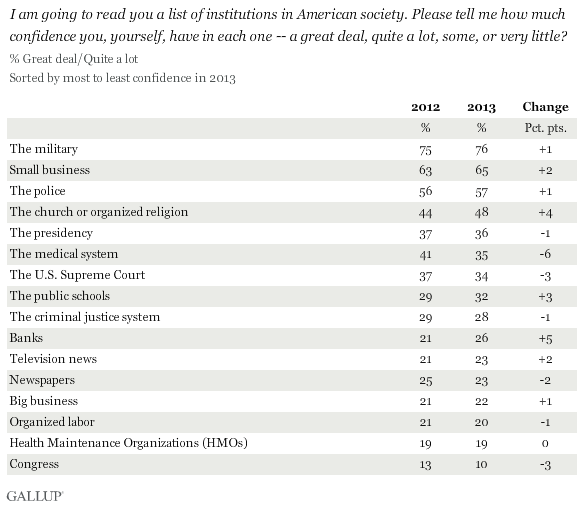 "Gallup will explore the long-term trends in Americans' confidence in other key institutions in future stories. "Results for this Gallup poll are based on telephone interviews conducted June 1-4, 2013, with a random sample of 1,529 adults, aged 18 and older, living in all 50 U.S. states and the District of Columbia. "For results based on the total sample of national adults, one can say with 95% confidence that the maximum margin of sampling error is ±3 percentage points. "Interviews are conducted with respondents on landline telephones and cellular phones, with interviews conducted in Spanish for respondents who are primarily Spanish-speaking. Each sample of national adults includes a minimum quota of 50% cellphone respondents and 50% landline respondents, with additional minimum quotas by region. Landline telephone numbers are chosen at random among listed telephone numbers. Cellphone numbers are selected using random digit dial methods. Landline respondents are chosen at random within each household on the basis of which member had the most recent birthday. "Samples are weighted to correct for unequal selection probability, nonresponse, and double coverage of landline and cell users in the two sampling frames. They are also weighted to match the national demographics of gender, age, race, Hispanic ethnicity, education, region, population density, and phone status (cellphone only/landline only/both, cellphone mostly, and having an unlisted landline number). Demographic weighting targets are based on the March 2012 Current Population Survey figures for the aged 18 and older U.S. population. Phone status targets are based on the July-December 2011 National Health Interview Survey. Population density targets are based on the 2010 census. All reported margins of sampling error include the computed design effects for weighting. 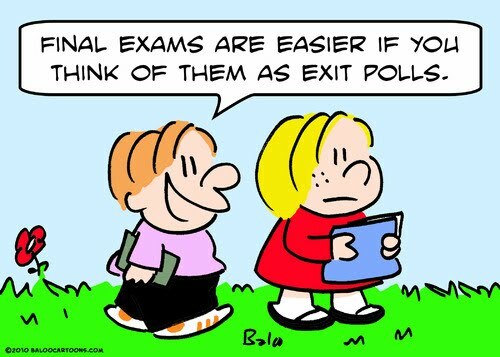 "In addition to sampling error, question wording and practical difficulties in conducting surveys can introduce error or bias into the findings of public opinion polls. "View methodology, full question results, and trend data. 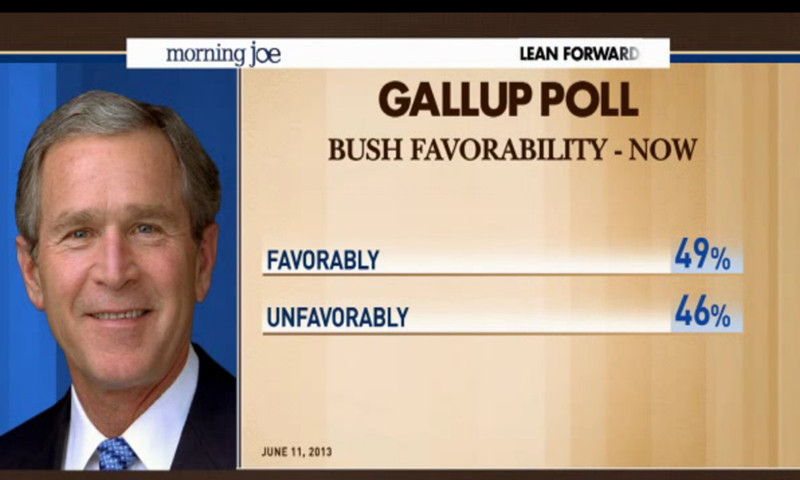 "For more details on Gallup's polling methodology, visit www.gallup.com." Note the alarming statistic for Labor: 20 percent, a success for Big Business and their propagandists...that will have to be corrected if unions are going to try to increase their membership anytime soon. And the fact that, "Americans have become more confident in banks, organized religion, and public schools, and less confident in the U.S. medical system," gives us pause too. 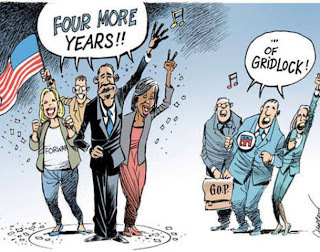 "Gridlock Is Top Reason Americans Are Critical of Congress -- Nearly four in five Americans in June disapprove of job Congress is doing," a piece by Lydia Saad at Gallup. 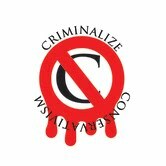 Congressional approval at 16% in May," by Elizabeth Mendes, also at Gallup.com. When dealing with short memories, the American voter has no peer; when falling for Conservative propaganda, the American voter has no superior.